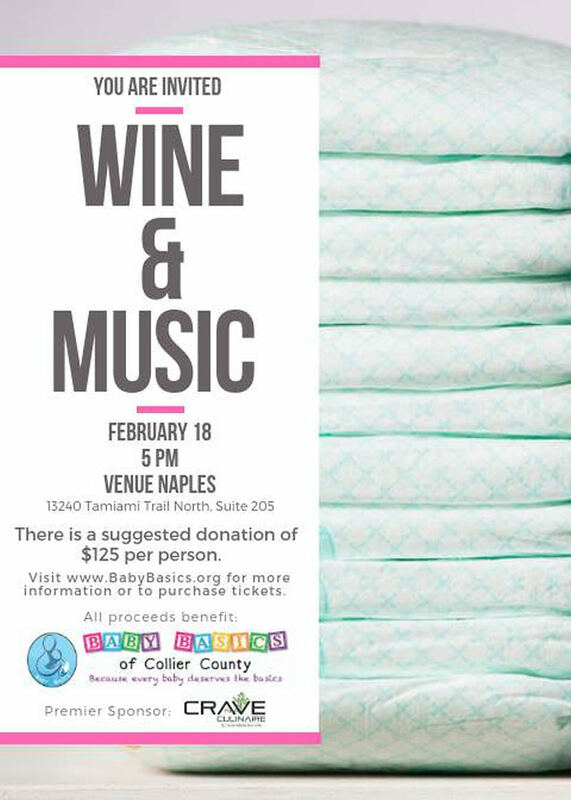 You are cordially invited to Wine & Music to benefit Baby Basics of Collier County. The evening will include wine, delicious hors d’oeuvres by Crave Culinaire, and beautiful music by Touch of Class and Naples-Area Youth on Monday, February 18 at 5:00 p.m. at Venue Naples, located at 13240 Tamiami Trail, Suite 205 in Naples. There is a suggested donation of $125 per person. To make reservations for An Evening of Wine and Music, please contact Monica Bailey at MaBailey23@AOL.com or send a check to Monica at 8510 Danbury Blvd #202, Naples, FL 34120. All donations will be multiplied by Give Where You Live Collier, a program of the Community Foundation of Collier County and the Richard M. Schulze Family Foundation $500,000 matching fund. Checks must be received by February 18, 2019, dated February 20, 2019, made out to CFCC, and have Baby Basics on the memo line.